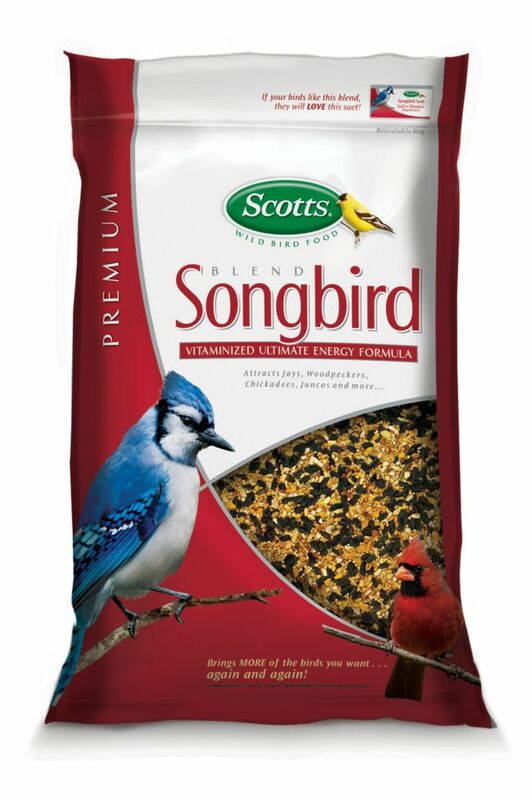 Scott's Songbird Wild Bird Seed is a premium blend of sunflower, peanuts and corn. The blend attracts colourful Cardinals, Blue Jays, Chickadees and Grosbeaks. Feed this blend in a large hole tube feeder or a barn style feeder. This blend is a patented formula to attract twice as many birds and formulated with twice the energy seeds for superior digestion, absorption and health. 24 months freshness guarantee from date of manufacture. All bags marked with Best Before Date. Royal Jubilee Granola Stacks Sweet Songs are formulated to attract gold finches, juncos and chickadees. Use as a secondary feeding opportunity to compliment their base seed blend diet. The Granola Stacks are blended with sunflower, millets, safflower, nyjer and peanuts. Stacks are hard pressed to mimic natural feeding and must be fed on the Royal Jubilee Granola Stack Feeder purchased separately. Simple and easy to feed. Try an assortment of Granola Stacks on your feeder for a wider variety of birds or put 4 Sweets Songs on the feeder for maximum visits of all colourful and friendly birds. Native and migratory birds will love the blend they find in this Scotts Morning Melodies Premium Pail. Premium Year-Round is designed to attract a wide variety of common feeder birds. Blend is stored inside a re-closable lid pail making storage & handling clean and simple. Attract migratory birds to your home with the help of Scotts Fruit and Nut Blend. This scientifically fortified blend features high amounts of peanuts, sunflower chips and walnuts, a combination highly sought out by birds. It also includes pineapples, cranberries and raisins, allowing migratory birds to fulfil their nutritional needs as they spend time at your home. Superior digestion, absorption and health. Songbird 6.36KG Scott's Songbird Wild Bird Seed is a premium blend of sunflower, peanuts and corn. The blend attracts colourful Cardinals, Blue Jays, Chickadees and Grosbeaks. Feed this blend in a large hole tube feeder or a barn style feeder. This blend is a patented formula to attract twice as many birds and formulated with twice the energy seeds for superior digestion, absorption and health.